Contacts entered are available for editors to assign contacts as asset owners or risk owners in the risk assessment, and also as the person responsible for the implementation of mitigating controls in the gap analysis and risk treatment. 3rd party vendor, just to name a few. After opening Contacts into the work space, click the ‘plus’ button. Fill out the General Information. Repeat this process for all other contacts to be used in the risk management process. 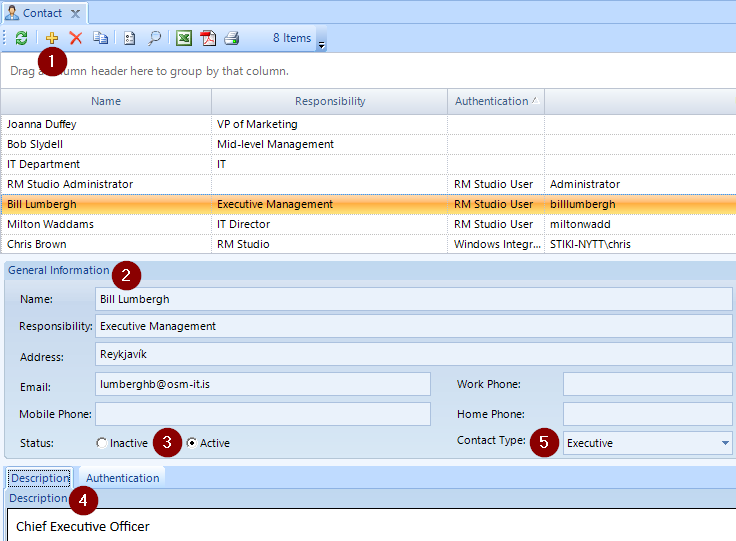 Status of Active or Inactive is critical after using RM Studio for a while. Be default all new Contacts are Active, but if a Contact leaves your organization and they have been assigned as asset or risk owner in a risk assessment, then you are unable to delete the Contact, so you select Inactive for future reference. An Inactive Contact will not populate in any of the assessment drop downs for assigning a contact name. Use the Description field to enter any information for the Contact that hasn’t been entered in the General Information. Assign a Contact Type, if desired, but you will need to create the Contact Types you want to assign. *Tip* Use the Import function under the Main menu to save yourself a lot of time. Remember to check the RM Studio formatting required before importing from a spreadsheet document. 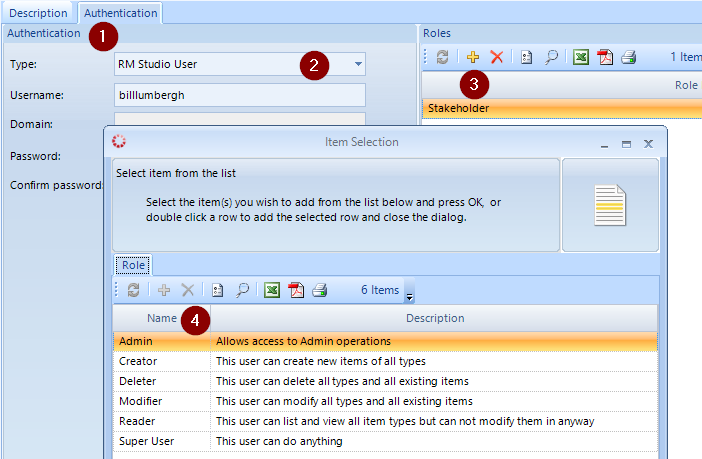 Using the Authentication tab under General Information, you assign RM Studio access to the users. Choose the Type, either Windows Authentication or RM Studio User. Windows Authentication requires the Username and Domain. The RM Studio User requires you to create a unique username & password for the login. Remember your license is limited to a certain number of users. Assign the Roles of the user by clicking the ‘+’ sign to open the popup with the list of Roles. Select the appropriate roles for the contact. There are several predefined roles, but feel free to add your own as necessary in the Security settings under the Main menu.